VCRTA members make significant contributions to the community. Members volunteer their time to worthy organizations, activities, and events in the community. Since 2005 in the span of 14 years, VCRTA members have volunteered over 280,000 hours to the community, the equivalent of over 11,841 full 24 hour days or over 32 years. When the retired teachers of VCRTA give, they give big! In 2018 alone, VCRTA members volunteered 9,870 hours to the community. The Vigo County Retired Teachers Association invested the equivalent of 411 days or approximately 1.1 years of service in a single year. VCRTA members also donate financially to community programs, non-profit/non-political guest speakers, educational supplies and interests, and towards grants to support educational endeavors. Where do VCRTA members volunteer their time? This list is not exhaustive but examples include the Salvation Army, Lighthouse Mission, Union Hospital, Regional Hospital, Susan G. Komen, League of Women Voters, Kids Hope, Wabash Senior Citizens Center, Vigo County Public Library, Court Appointed Special Advocates (CASA), Hospice of the Wabash Valley, A Point In Time, Crisis Pregnancy Center, Terre Haute Children’s Museum, Educational Heritage Association, area churches, local nursing homes, and local schools. Each year VCRTA members have a tremendous impact on the community. 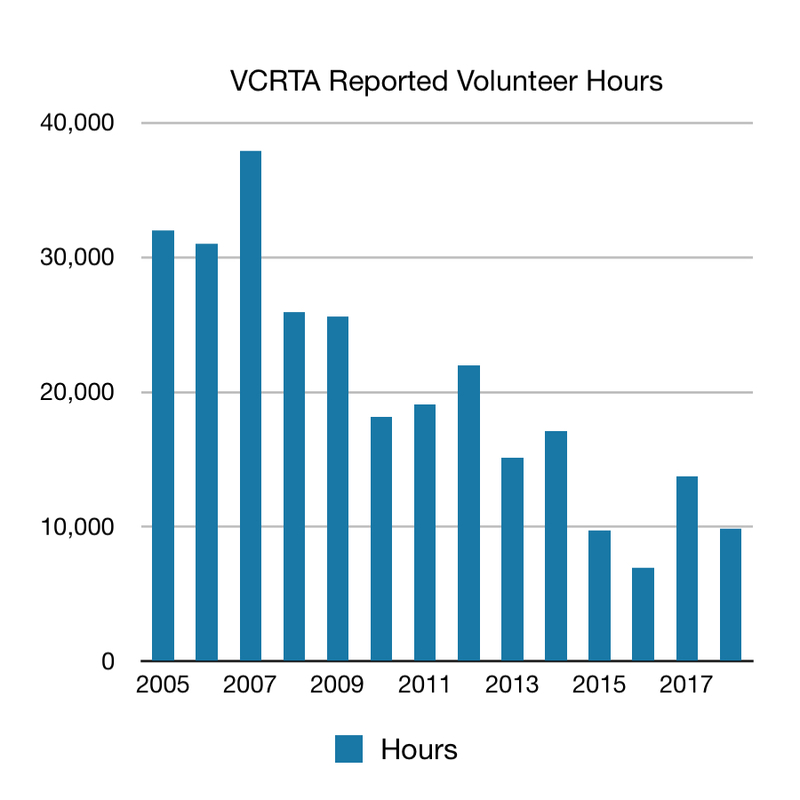 The following graph demonstrates the number of volunteer hours reported by VCRTA members. This, however, does not represent VCRTA’s total volunteering effort. In any group of volunteers in the community, it is likely that there is at least a few retired teachers in the group. Attached is a link to a Volunteer Form which may be used to record your volunteer hour. As a reminder, please differentiate the “Youth” and “Adult” hours. Volunteer hours are collected at the December luncheon.